Marine Scotland initiated a project to improve protection given to PMFs outside the MPA network in May 2017. This followed an incident in Loch Carron in April 2017 when a flame shell bed was damaged by scallop dredging activity, and resulted in the designation of the Loch Carron MPA. The Cabinet Secretary for Environment, Climate Change, and Land Reform also requested that necessary steps were taken to ensure that PMFs were being protected in accordance with the National Marine Plan. The National Marine Plan states that “Development and use of the marine environment must not result in significant impact on the national status of Priority Marine Features”. Furthermore the Marine (Scotland) Act 2010 requires that decision makers should act in the way best calculated to further the achievement of sustainable development and use, including the protection and, where appropriate, enhancement of the health of the Scottish marine area. Most industries have to go through a licensing process, with many required to undertake environmental impact assessments to enable the regulator to determine whether a project will have a significant impact. PMFs are considered in this process, and SNH provide advice to regulators based on published guidance. All regulators should continue to make decisions in accordance with the policies set out in the National Marine Plan. There is no equivalent mechanism for fisheries. Therefore Marine Scotland commissioned SNH to identify locations where there is a need to consider additional management for bottom contacting mobile fishing gears to ensure there is no significant impact on the national status of PMFs within the 6 nautical mile (NM) limit. The rest of this document sets out the process for determining these areas. The principal aim of the project is to ensure that the necessary fisheries management measures are in place to ensure protection of PMFs, and comply with the relevant policy in the National Marine Plan. The current PMF list has 81 habitats and species and therefore a prioritisation exercise was undertaken. 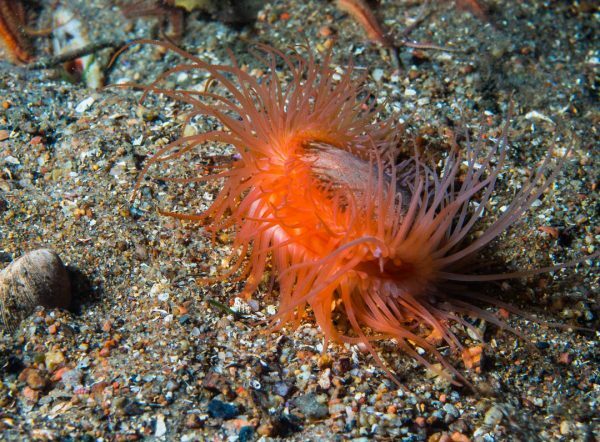 Through this process Marine Scotland and Scottish Natural Heritage (SNH) identified 11 habitats which are particularly sensitive to impact from bottom contacting mobile fishing gears. The 11 habitats and species are a very important part of the marine ecosystem. They provide a range of natural goods and services from which we all benefit. Further information on these processes are in Annex C.
Whilst the focus in this project is on managing fisheries to ensure the conservation of these important habitats and species, it is anticipated that the SNH advice documents form part of a wider context. It is expected that the advice in the assessment of each PMF will have relevance to all industries and regulators. Separately, SNH is also developing more detailed guidance on those habitats and species which are regularly assessed in relation to development proposals. Potential reasonable alternative management approaches. This consultation is not asking whether measures should be implemented. Another consultation will follow where measures will be proposed and it will be accompanied by a Sustainability Appraisal. Read the original post from Marine Scotland here and find more information on the spatial data here. The consultation closes 31 Aug 2018. Download the consultation paper.